Here are six ways introverted leaders communicate with impact to become those favorite managers. In a time when everyone is looking down at their smartphones, spontaneous conversations are becoming less frequent. But when you engage with people, you can learn so much and reap benefits you would never have imagined. For instance, during a flight, I sat next to a man who works as a ticketing manager for a theater in Atlanta, Georgia, my hometown. We chatted about acts we had seen there, and he told me he oversaw ticket sales. Several months later, I watched my favorite dance company perform, thanks to my new friend’s generous gift of house seats. Random conversations can lead to tangible results, and you will inevitably learn something. Beth, a self-described introvert wrote me after she heard me talk about spontaneous conversations. “Vegas (where the convention was held) was a hard town to be in as an introvert,” she said. “That night, as I hailed a cab, I was overly tired and just wanted to get to the hotel and away from the crush of people…. The cabbie started talking with me, something I generally avoid. But I thought about practicing engaged listening and decided I would try it. It turns out, we had an amazing conversation about the educational system in Nevada. Beth was grateful she took the time to listen and learn from this man. Research has shown that introverts tend to communicate apprehension more than extroverts. According to several studies, people with communication apprehension can be perceived as more distant, submissive, and indifferent to the people they speak to. This can inadvertently become a disadvantage for introverts in everyday communication and lead to misinterpretation by others. To overcome this, introverts tune in to recognize miscommunication, They use video conferences over audio conference because they can read facial expressions, which gives them clues into how others are thinking. Voice alone is not as revealing to them. Introverted leaders working with culturally diverse groups also benefit from their tuning into facial expressions. If they see a person smiling and think they are not happy, they can probe or observe to better understand what is really going on. Assets that serve introverts well in times of change and uncertainty are a calm focus and grounded energy, which help people stay centered. We look to leaders for reassurance and direction. Introverted leaders find ways to be more visible, so people can feed off their calming energy. After a recent emotionally charged national election, introverted Julia organized a group of people with diverse political viewpoints. The goal was to learn from each other and decide how to move forward in a time marked by deep divisions. Julia stepped out of her comfort zone to enroll friends and neighbors in helping her set up the group, which grew from 6 people to 100 in four months. After the group grew organically, she pulled back on her time. Julia saw that her push toward visibility as an “out there” leader served a good cause in the start-up mode. And as a self-aware introverted leader, she wanted to honor her need to recharge and step back from the external pulls on her time. Several others in the group have stepped up to help continue the calm, open dialogue that Julia established. Dr. Gene Griessman, the author of The Achievement Factors, responds calmly to proposals he disagrees with by saying, “That is an intriguing idea. Could you tell me what you think the strength and weaknesses of those strategies are?” Griessman poses the question, “Would you mind if I give you another point of view?” As an introverted leader, your calm demeanor and reasoned questions like these will help to set the tone for a civil conversation. Mary Barra is the CEO of General Motors. As a young engineer, she confronted an assembly worker who directed a wolf whistle in her direction. “What are you doing?” she asked. He was trying to attract her attention, he told her. She requested that in the future he do that by saying “Hi.” This simple yet assertive statement resulted in more respectful greetings from him, and according to Barra, the catcalls from other men in the plant diminished. Being an introvert, as Mary Barra is, shouldn’t limit your ability to assert yourself. Assertiveness is often incorrectly confused with aggressiveness, but assertiveness is characterized by mutual respect and clear, open, and honest communication. Aggressive behavior, on the other hand, is disrespectful and shuts people down. Introverts show us that you don’t have to “raise your volume to have a voice,” as author Susan Cain wrote on the cover of Quiet Influence. For my book, The Genius of Opposites, I studied pairs of workplace introverts and extroverts. My research showed that the introverts’ steady, intentional persistence often made the difference in their success. On one sales team, introverted Brian stood in the back of the room, quietly checking in with prospects and responding to their questions. His louder, extroverted teammate, Audrey, made an exuberant pitch from the stage. Brian was assertive by following up with his key target customers for months and, in some cases, years. He closed most of the deals through his persistence and follow-through. There are countless opportunities to speak up for yourself. Introverts such as GM’s Barra have pushed themselves and developed their skills in this area by practicing and pushing themselves to speak up. It is not always easy. Figure out when it is important to set boundaries and find ways to express yourself that are respectful, yet firm. They advocate for employees. Melinda Gates, a co-chair of the Bill and Melinda Gates Foundation, makes a point of speaking up in support of female colleagues “when a man restates something that a woman already said or talks over her at a meeting.” And she calls herself out when she falls into that behavior herself. They also support introverts on your team when they don’t feel comfortable asserting themselves. Bill Stainton, a professional speaker, and Emmy Award–winner was chairing a professional board. He tells the story of failing to ask Lucy, an introverted board member, more about her background and skills. After she finished her board term, he discovered Lucy had a goldmine of expertise in an area that would have been helpful in growing their organization had he known. Bill considered it a large missed opportunity. After that experience, he made it a point to learn more about the strengths of the people he is working with, especially when they don’t freely self-disclose that information. Many people experience discomfort when team members disagree, employees push back, or bosses question ideas. They see conflict as negative. It helps to remember that conflict is natural, necessary, and normal. In fact, creative solutions to problems rarely occur without the tension of dissimilar ideas. For instance, the Wright brothers, inventors of modern air travel, were known to have intense disagreements over the course of their collaboration. Like Lincoln, Anne Mulcahy, former Xerox CEO, knew she could not lead from behind closed office doors. She often went into the field to speak with executives, employees, and, most mi potently, customers. “Even though Rome was burning,” she said in a 2006 speech, “people wanted to know the future.” Today she is credited with leading a very successful business turnaround. 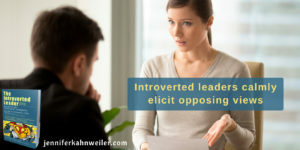 Introverted leaders orchestrate productive dialogue to engage both the introverts and extroverts on their teams. This becomes especially important when managing people from different cultural and ethnic backgrounds or working across the globe with customers. These six approaches give a glimpse into how leaders who don’t rattle their sabers quietly pull from their natural strengths. They are the memorable ones who we look back on with gratitude for they helped us grow and accomplish more than we thought possible. Jennifer B. Kahnweiler, Ph.D., Certified Speaking Professional, is a global speaker and expert on introverted leaders. She helps organizations to harness the power of introverts and is the author of The Genius of Opposites, Quiet Influence and The Introverted Leader which have been translated into 16 languages. Reach out to Jennifer on Linked In, Twitter, Facebook and on her website. This entry was posted in Uncategorized on July 12, 2018 by Jennifer Kahnweiler.